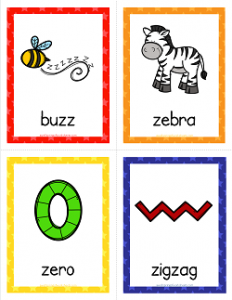 I’m glad you came to check out this page of things that start with z. We’ve got the words zebra, zero, zigzag, zinnia, zipper, zoo, and zucchini. And because I couldn’t come up with something else that started with the letter z, I added buzz because I thought kids would like to say it and it’s good letter sound practice. Be and sure to point out that the z in this word is an ending sound rather than a beginning sound.